The National Theatre's critically acclaimed production of The Lehman Trilogy is heading to London's West End this May. Scheduled to light up the Duke of York's Theatre the play depicts the life one family, the Lehman's, as they build America's largest bank and then witness its demise 126 years later. Stars of the show, Simon Russell Beale, Adam Godley and Ben Miles all return for the production's West End run, as they portray the three original Lehman brothers, their sons and their grandsons in this epic play. Directed by the award-winning Sam Mendes (The Ferryman), The Lehman Trilogy is adapted from Stefano Massini's sprawling 2015 European drama. Tickets for The Lehman Trilogy, at the Duke of York's Theatre, is now on sale! A show depicting the successes and failures of three generations of Lehmans, beginning with Henry, Emanuel and Mayer, who came from Bavaria and settled in Alabama to make their fortune. The immigrant brothers and their descendants live a story of capitalism; they grapple with a rapidly changing society - one in demand of cotton, coffee and railways, to cigarettes, televisions and oil, navigating all the way up to their legacy's collapse into bankruptcy. The saga of the Lehman brothers is a glimpse into the American dream; a fresh start in a country where anyone willing to demonstrate talent and inventiveness can have it all, but also in which over only a few turns can reverse fortunes and destinies. It charts the transformation of a family's identity, and with the trilogy staged over an extended period of history, it may well entice you to reflect on your own connections to the past. 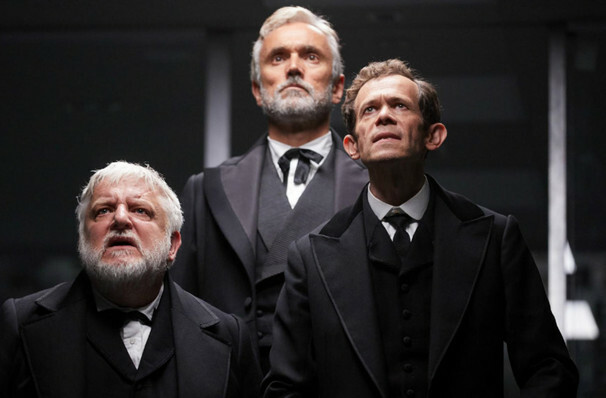 View our show pages for more information about The Lehman Trilogy, Piccadilly Theatre.